In the Pacific Island nation of Vanuatu more than 100 indigenous languages are spoken by fewer than 300,000 people (François et al 2015: 5-6; Vanuatu National Statistics Office 2016). The government has implemented a policy where children are now to be educated for the first 3 years in an indigenous language of the school’s choosing. This is to facilitate literacy development and to preserve endangered languages. However, in some classrooms more than one mother tongue is spoken. In such cases the policy recommends that the language with the most native speakers should be promoted. This is unproblematic for speakers of the larger language, but what effect does this have on those children who are instructed in a vernacular that is not their own? To answer this question, we conducted intelligibility tests across closely related varieties of northern and central Pentecost. We conclude that in villages where children already receive a good deal of exposure to other language varieties in their daily lives, implementation of the government’s educational policy is a viable option. 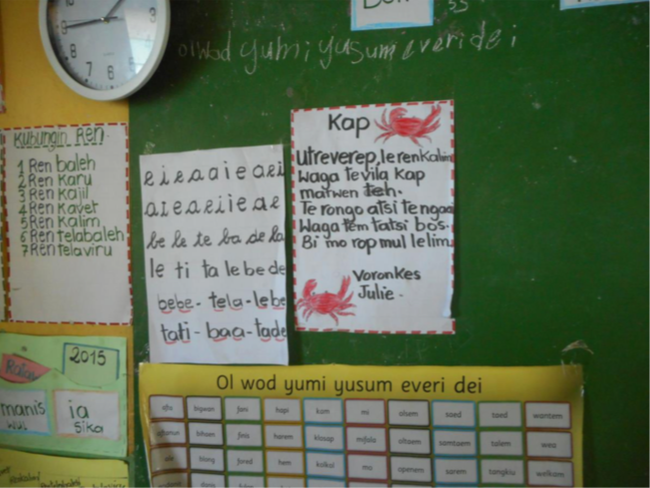 However, we make this point with the caveat that what is practical and beneficial for literacy education is not necessarily optimal for the preservation of small endangered language varieties.